Running your heating system all winter long can be very expensive. It can force you to cut back on other things you want to do in life. A gas fireplace can help you heat your home without having to run your heating system constantly. It can reduce your heating costs dramatically from the moment you turn it on. Here are some other reasons to install a gas fireplace. Gas fireplaces are easy to turn on. Compared to wood-burning fireplaces, gas fireplaces are incredibly easy to use. All you need to do to start one is press a button, and it’ll be up and running in no time. 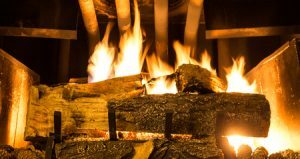 You won’t have to worry about loading a gas fireplace up with wood, collecting kindling, or doing any of the other tasks that typically come along with using a wood-burning fireplace. They don’t require much maintenance. In addition to being easy to use, gas fireplaces are also very easy to maintain. There won’t be any creosote that builds up inside of your fireplace. You also won’t have to spend time cleaning ashes out of your fireplace when you go with a gas option. As long as you clean your gas fireplace about once a year and have it inspected, you should be good to go. They’re safer than wood-burning fireplaces. A wood-burning fireplace can send things like embers out into your home. These red-hot embers can burn carpeting and even start a fire if you’re not careful. There is no chance of this happening when you’re using a gas fireplace. It’ll be your safest fireplace option. Would you like to install a gas fireplace in your home? Roofing by Bruce can install one for you and show you how to use and maintain it. Call us at 570-424-8891 to hear about the gas fireplaces we can add to your home.